MasterChef Jr. Winner Beni Reveals How She Will Spend Her $100,000 Prize Money asterChef Junior began with 40 talented home cooks between the ages of 8 and 13 and whittled it down to the Top 3: Avery Meadows, Beni Cwiakala and Quani Fields, who competed in the series finale on Friday night. The victor was Beni from Chicago, Illinois, who was 9 when she started filming the show and is now 11. She won over judges Gordon Ramsay, Christina Tosi and Joe Bastianich with a smoked salmon appetizer served on a corn blini and an entrée consisting of grilled veal chops with red cabbage saukerkraut and fondant potatoes. Along with the honor of being named MasterChef Junior comes a trophy and a $100,000 check, which has been put into an account that Beni won’t be able to access until she is 18. How hard has it been to keep the secret that you’re the winner? It’s been so hard because people at my school always ask me like, “Did you win?” And I have to say, “You have to watch the show,” like 500 times in one day. Now you’ll finally be able to tell people. Yeah, or they’ll see it. I’m really excited. I’m a little nervous about how they’ll react, but I’m really excited to finally tell people I am MasterChef Junior. 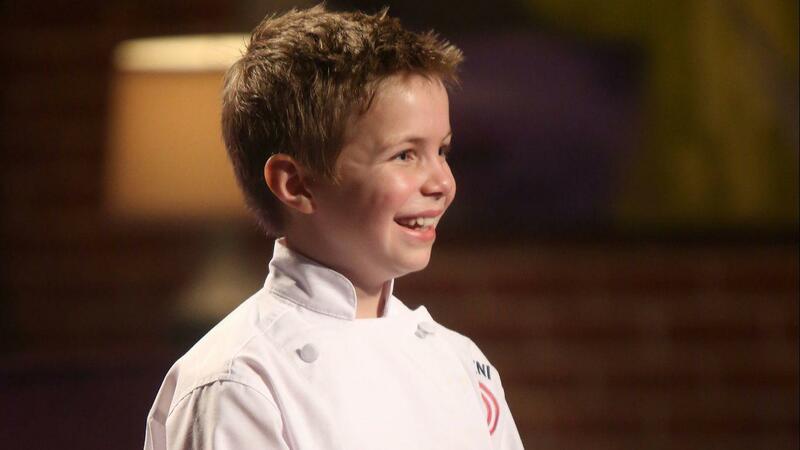 You came to MasterChef Jr. with so much talent, but what did you learn there? When I came in, I was a little inexperienced. I didn’t have that much experience cooking, but I cooked. So, I came in thinking, “I’m probably not going to make it that far,” but I learned that really never give up and just be yourself because being yourself and never giving up can get you places. You say that you didn’t have that much experience, but you came up with these incredible dishes that I would never think of. It seems as if you have a sophisticated palate for somebody so young. Where did that come from? My family always ate everything. My parents made us eat everything from anchovies to asparagus, and broccoli and all the stuff in-between, so I think that’s where my sophisticated palate comes from. I shocked myself when I made it to the finale and I realized that I’m a pretty decent cook, so I’ve decided to follow my dream of cooking. Was part of the fun of the MasterChef Junior kitchen that there were ingredients that you don’t have readily available in Chicago so you were able to try a lot of new things? Was there one thing in particular that Gordon, Christine or Joe said to you that will stick with you? I can’t remember what challenge it was, I think it was the chocolate challenge, but Gordon said, “Beni, Beni, Beni.” That’s one thing that always will stick with me. Just repeating your name three times? Yeah, that’s it. My dad always says, “Beni, Beni, Beni.” It was really nice and I really liked it, just those three words, Beni, Beni, Beni. Have you gotten to do anything exciting since winning? I was in the Tribune a couple of times. I got to go around my school and show them how to cook and I’m going to be doing this thing at Chicago Children’s Theatre. You were trying to stay true to your heritage. What was it that you made that was Polish food? I made a Polish-style chicken pot pie because my nana, my grandma on my dad’s side, is Polish, but she was pretty much born and raised in England. So, she’s very proper. I decided to make a chicken pot pie, but the Polish food was beets, sauerkraut, that’s Polish. How old were you when you started in the kitchen, and was it your mother or your grandmother that taught you how to cook? I started in the kitchen around 3 or 4. It was really mostly my dad that I started cooking with. Your dad makes dinner for the family? Yes. When we come home from school, he’s usually the first one home. My mom doesn’t get home until like five, so, my dad usually starts dinner. Have you taken that over at all? Is there a night of the week that it’s your turn to make dinner? Yes, every Wednesday it’s my turn to make dinner. Can you cook anything you want, or you just have to work with whatever’s in the refrigerator? I usually look at a recipe and decide, “OK, I want to make that.” Sometimes I come up with my own dishes. Yeah. So, it’s either I look at a recipe or I make my own, but usually I look at a recipe because I like to try stuff that’s new. I was really surprised with the final three. I thought that you and Avery might make it, but I thought Olivia or Mikey might make it to the finale instead of Quani, because Quani had made some mistakes early on. Were you surprised by the final three? No offense to Quani, but I was definitely surprised that Quani made it because like you said in the beginning, he was at the bottom a couple of times, but I knew he was really good at baking. I was definitely scared of Avery. Avery is a really good cook, and I was really worried about her. I was like, “Oh, shoot, she’ll probably beat me,” but I was thinking that Mikey would get to the finale instead of Quani. Me too, especially when he won the Golden Apron, right? Yeah. I read an article that he was in and Mikey said when he won the Golden Apron and then got to skip the team challenge, our skills could’ve improved, and that was maybe a reason why he didn’t make it to the finale. That’s what he said. A shame. You’re both from Chicago, do you think you’ll see each other? He’s coming to the finale party. Since the show, I saw him a couple of times, but not as much. We had two get togethers, but that was last year. What are you going to do next? Are you going to do anything different, or are you going to go back to school and business as usual? I’ll definitely continue with school. I think I’ll participate in cooking, maybe festivals or something like that. I definitely want to travel more and eat new food. I definitely want to start cooking more than once a week. That sounds like a good plan. Also, maybe you’ll do something like Quani and start your own business. Quani’s very good. I definitely want to maybe start doing YouTube videos, like tutorials about cooking.